Pope Benedict XVI last week criticised China for consecrating a bishop without Vatican permission. The Vatican will move to resume relations with China after more than half a century if religious freedom is allowed but it will not abandon China's diplomatic rival Taiwan, an official said yesterday. The Vatican, which Taiwan sees as an important ally as it fights for international legitimacy against China, would seek to restore an apostolic nunciature in Beijing for the first time since the Communist Party began ruling China in 1949, said Monsignor Ambrose Madtha, charge d'affaires at the Vatican's diplomatic mission in Taipei. But the Vatican would seek to keep a delegate in Taiwan, he said. Taiwan split from China in 1949 after the civil war that brought the Communists to power, and the Vatican went with it. 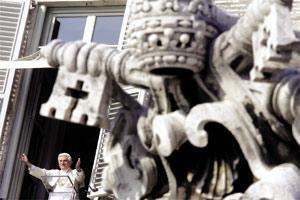 "Holy See's position is quite clear and is known to the Taiwanese government," Mgr Madtha said. "The Holy See would maintain its delegate in Taipei. The Holy see will not abandon Taiwan." Taiwan officials know about the Vatican's hopes for China but will not comment on anything presumptive, Ministry of Foreign Affairs spokesman David Wang said. Because China sees Taiwan as part of its territory rather than as a country, it is unlikely to let the Vatican or any other government maintain ties with Taiwan while pursuing diplomatic relations in Beijing. Taiwan officials believe China is trying to isolate their island by persuading Taiwan's 24 remaining diplomatic allies to switch allegiance, joining 170 countries that already recognise Beijing over Taipei. About 10 million Catholics live in China, but many are cut off from the Vatican, worshiping underground in fear of restrictions if they join government-sanctioned churches. The Vatican has indicated to Taiwan it would like to help those "lost sheep", Mr Wang said. Vatican-China relations dipped last week, when Pope Benedict criticised China for consecrating a bishop without Vatican permission, sparking outrage from Beijing days later.